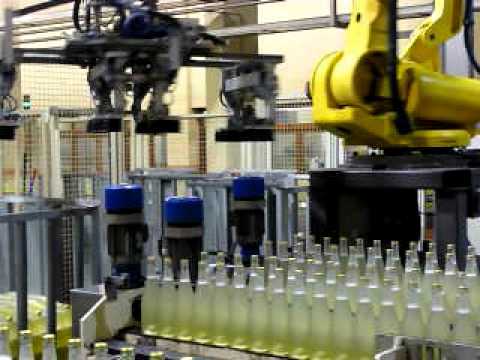 EMMETI is a premier supplier to wineries, breweries, spirits bottlers and glass suppliers, offering proven solutions that are designed, built and ready to operate365 days per year 24/7. 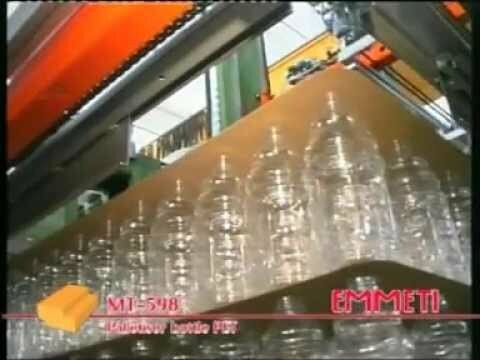 EMMETI has been designing and manufacturing factory automation equipment since 1982, with a worldwide reputation as a supplier of reliable, technologically advanced container and package handling systems for glass, plastic and metal containers, as well as cartons, cases, trays and other packages. Our machines have no proprietary parts. The EMMETI organization consists of four closely related, privately owned, companies: EMMETI, MECTRA, SIPAC, and LOGIK. Each of the four entities is an independent organization, owned by the same shareholders. Each of the four companies has a design and production facility near Parma, Italy, about a 60 minute drive from Milan and Bologna. EMMETI acts as headquarter for the entire group. Our USA offices offer sales, service, customer support, training and spare parts. Handling the products you are running today, and the products you do not even know you will be running in the future. Emmeti Group - A united group to provide complete solutions. Contact us at (814) 466-2183 or bzduffy@emmetiusa.com for detailed information on any Emmeti products. 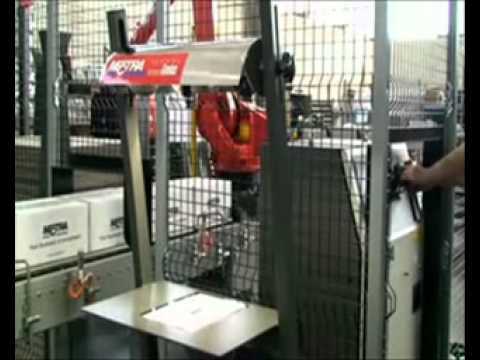 We offer sweep off, pick & place, robotic and traditional systems. Designed and manufactured for your application. Flexibility and simplicity with complete troubleshooting system that covers the entire production cycle. Intelligent operating panel from the touchscre3en allows manual operations, and job change set-up access. LOW MAINTENANCE due to the self lubricating guides and support, keeping maintenance cost at a minimum. Access the machine from all sides. Model Octopus - Want the ability to get bulk and cased ware on the same machine? 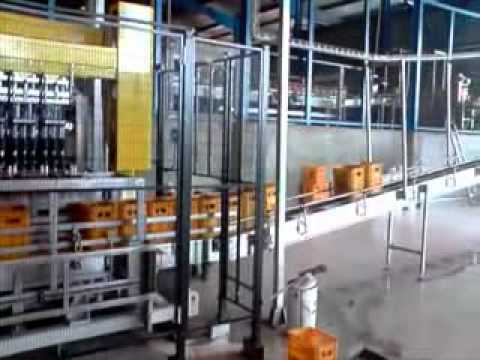 Depalletize cases or bulk glass with the same machine. Flexible and reliable. 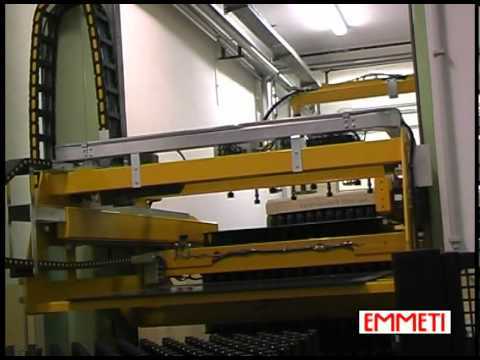 Automatic low level palletizers (high level systems available) for cartons, cases and shrink wraps. High speed or low speed applications - we've got your solution. Worldwide Market Leader of depalletization and palletization projects due to our experience and high quality standards of our machinery. 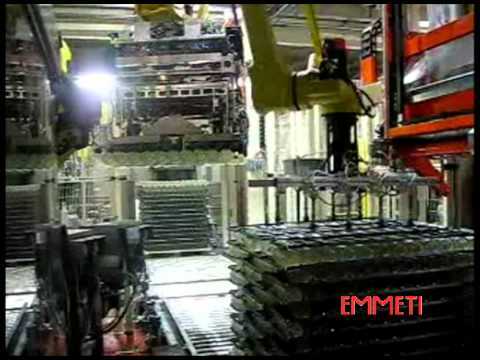 Ever Evolving to meet market demands our constant research and implemtation, is evident in every part of the Emmeti organizations production cycle from our administrative and sales departments to the engineering and production division. 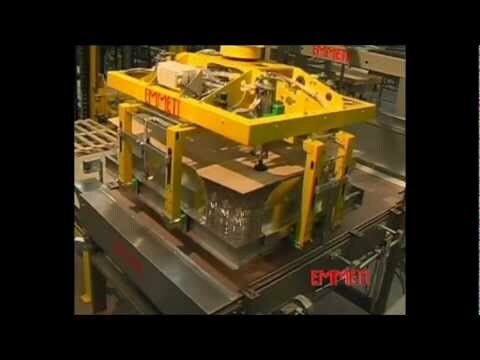 Jars, bottles, flacons, cans are no problem for Emmeti's case packers, using gripping, magnetic and vacuum pick up. Switch product. Switch infeed and outfeed - our machines are flexible. Perform a job change in 5 minutes with no tools and no manual adjustment. 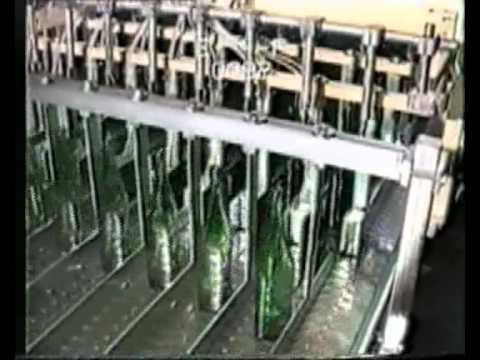 Placing champagne bottles in a horizontal position for "quarantine" and storage, awaiting the second phase of the process. 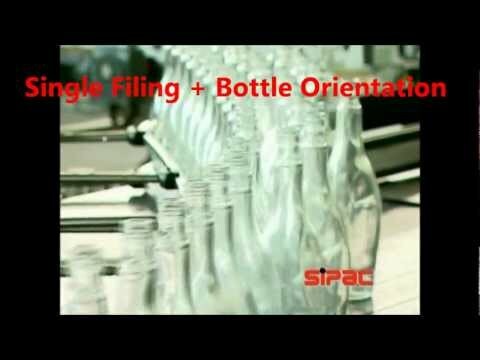 Emmeti case packers will never "drop" pack your bottle . Emmeti cases packers pick and place bottles into the case gently. Ready for Club / Warehouse Store nees. We realize how limited floor space inside the winery can be. Accumulation tables that are compact, but highly efficient. 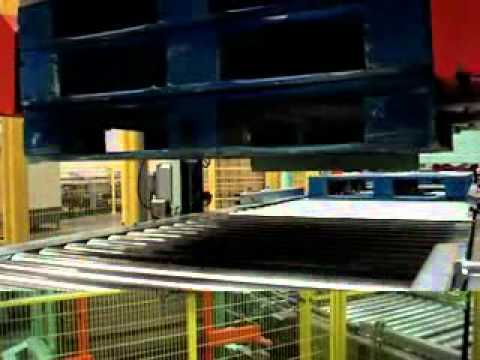 Efficient, affordable conveyor solutions. 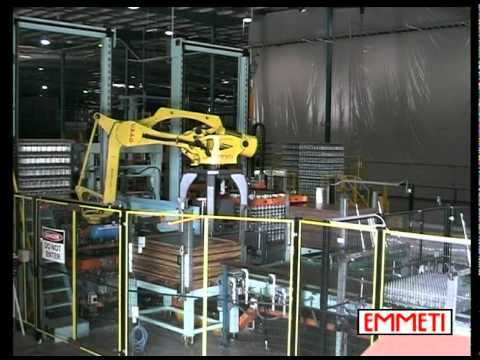 Emmeti offers both upper and lower level palletizers and depalletizers, case packer, uncasers, conveyors, and many more machines. 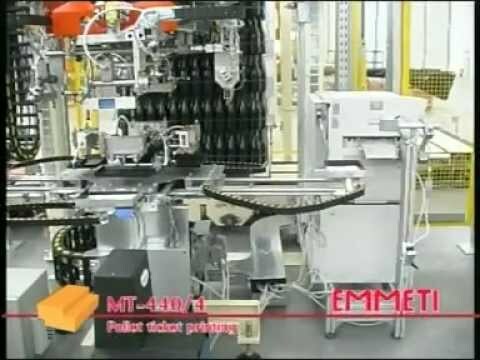 If your winery is running high speed, low speed, round, oval, reverse tapered or any other geometrically challenged bottled in-between, Emmeti has handled them all and we have a solution for your company. Competitively priced, with a small footprint designed to fit your floor space. 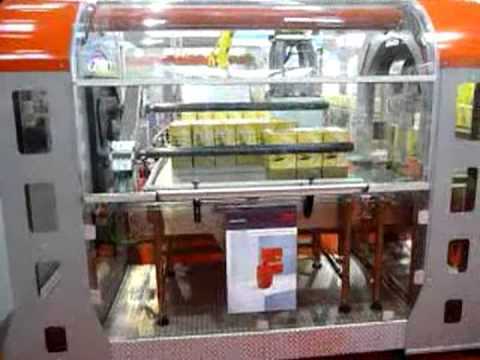 Very Smooth And Gentle Servo Driven High Speed Case Packer. Recipe Driven. 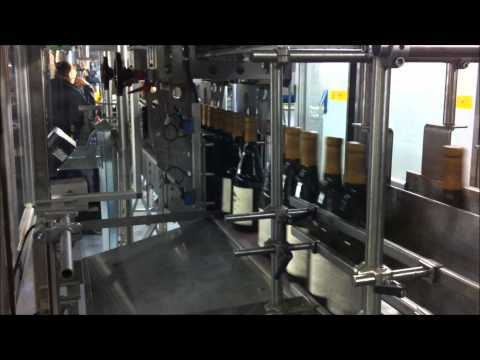 Ideal For Wine Filling Lines Operations For Its Smooth And Gentle Handling Of Full Bottles Of Glass To Avoid Impact (Damage In Glass Is Not Visible But Is Progressive) or Damage To The Labels. Speed Adjustable To Match Speed Of The Production Line. 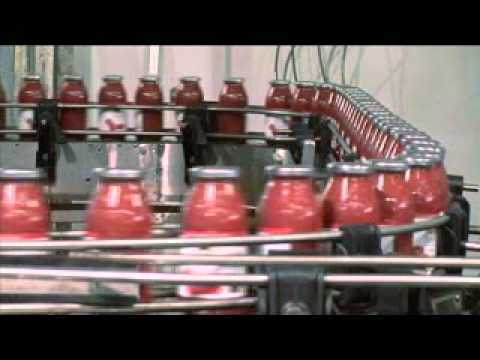 Can Be Supplied With Its Own Case and Bottle Conveyor Or As A Stand Alone Unit. 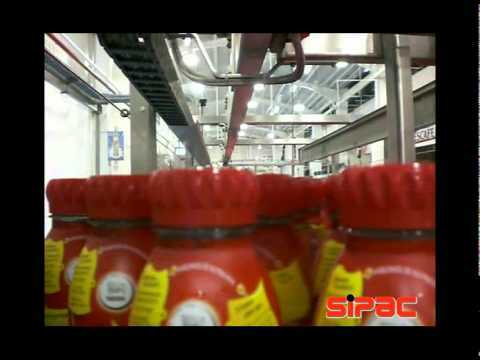 Servo Driven High Speed Self Adjustable Continous Motion Bottle Divider. Recipe Driven No Tooling Required Automatic Job Changes To The Bottle Diameter (Up to 6 Inches) and Number Of Desired Discharge Lanes (Up To 6). The Servos Do The Job For You. Ideal For Wine Filling Lines Operations For Its Smooth And Gentle Handling Of Full Bottles Of Glass To Avoid Impact or Damage To The Labels. Speed Adjustable To Match Speed Of The Production Line. Can Be Supplied With Its Own Conveyor Or As A Stand Alone Unit. The video shows how to properly form a layer of oval containers on table. All pneumatic devices installed along the layer forming table are required to compensate the holes created by the nestled layer formation. In this way, it is avoided the risk of containers turning in the empty spots. New palletizer with multi-task head. 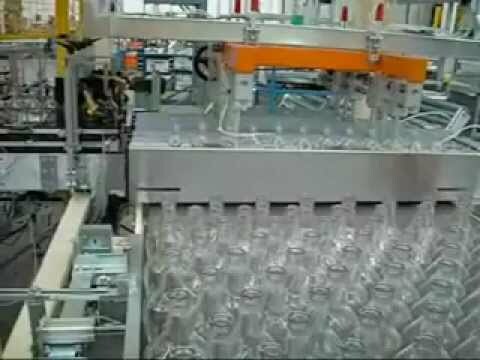 Designed to handle layers of bottles with bladders, partitions, tier sheets and trays formed by our patented vertical tray former (Video 2). 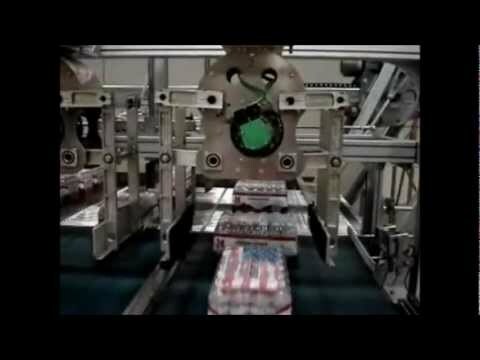 Labeller for full pallets - Prints and applies 4 labels at the same time. MT574 Case Case Palletizer Shown In A Bottle Water Plant Application Fitted With High Speed Case Rotators, Single Row and Layer Pusher, Sliding Rollers Pallet Building Head, Empty Pallet Magazine, Optional Tier Sheet Inserter And Featuring Our Exclusive Perfect Pallet Corners Technology, Multi Pattern Capability, Zero Job Change, Zero Tools. Design Suitable For Either High or Low Level Applications. Equipment Supplied With Its Ancillary Case Infeed Divider Conveyors, Braking and Metering Belts To Be Attached To Your Conveyor Line And Full Pallet Handling and Stretch Wrapping (Optional) For Single or Dual Pallet Fork Truck Pickup. 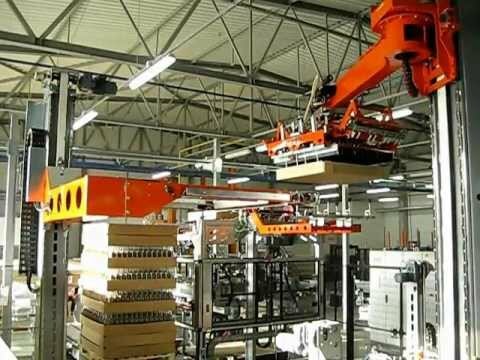 Equipment Modularity Allows To Be Purchased Separately As Fully Funtional Self Standing Modules To Be Integrated Into The Production Line or As A Whole For A One Stop Shop Turn Key Delivery. 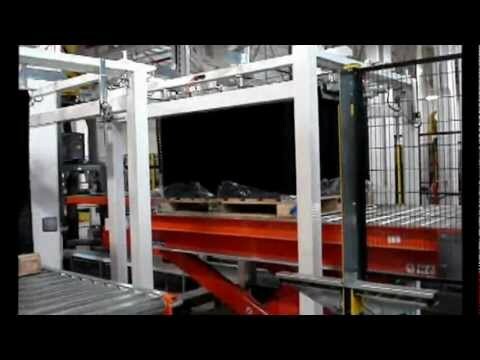 Combo 2-in-1 Robotic Palletizer / Depalletizer specifically designed for reselect / labeling / decorating lines with all in one head : bladders for bottle layers / suction caps for tier sheets / grippers for top frames. 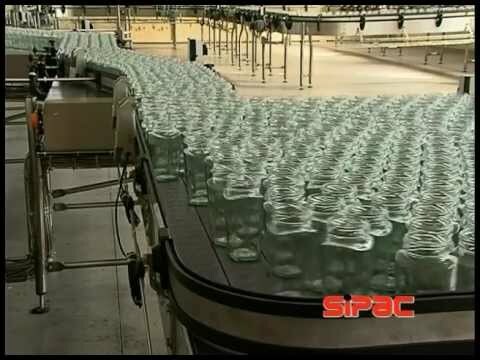 Filmed At Our Facilities Internal Test Loop This Video Shows A Line For 30K + BPH Non Round Wide Mouth Jars Being Mass Conveyed At Low Speed, Then Single Filed and Orientated. 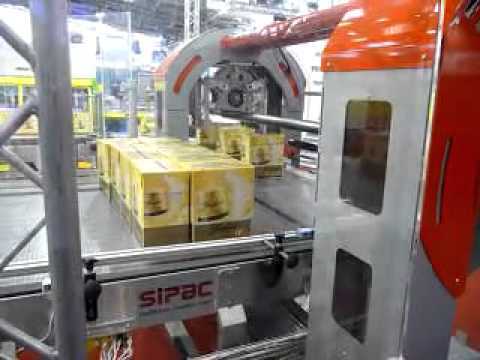 MT598 PET Series Low Level Pick-And-Place High Speed Palletizers Shown Running In An Application Handling A Typical Energy Drink. Equipment Is Supplied With Its Completely Enclosed HEPA-Type Infeed Air Conveyors System And 1-6 Divider. Equipment Also Comes With Built In Empty Pallet Magazine, Tier Sheet Magazine and Top Frame Magazine and Their Respective Handling Devices Plus Recycling System For Reusing Empty Pallets Coming From The Tier Sheet And Frame Magazines. 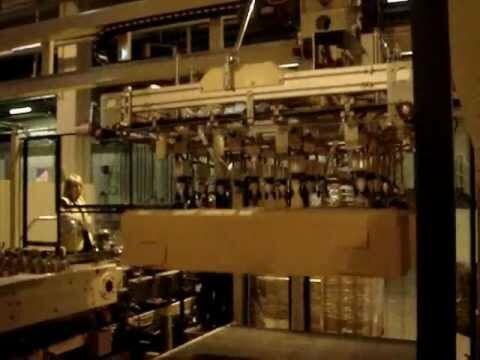 MT650 Low Level Pick-And-Place PET Series Palletizers. 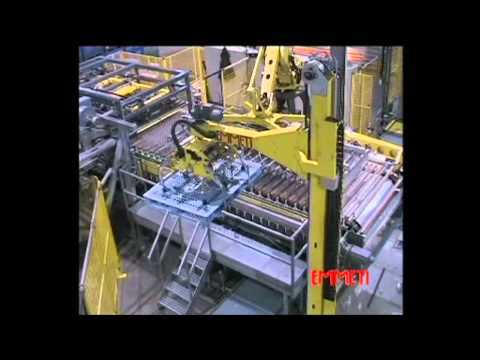 Shown In An Application With A 3-in-One Multi-Purpose Head For Handling -In Addition To The Contaniners- The Empty Pallet, The Tier Sheet And/Or Top Tray. 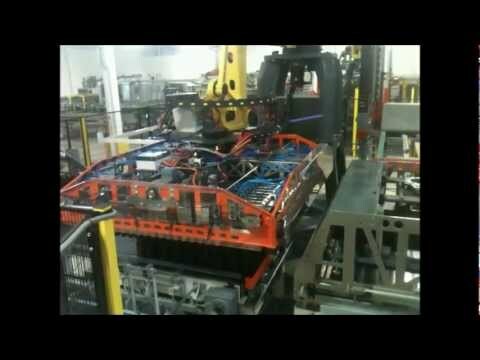 Also Shown In this Video A Horizontal Tray Former For Placing Inverted or Right Side Up Trays In Between Or On Top Of The Layers. 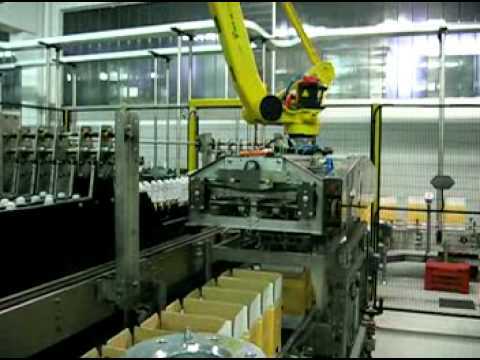 MT600 PET Series High Speed Palletizers Shown Running In An Application Handling A Typical Energy Drink. Equipment Is Supplied With Its Completely Enclosed HEPA-Type Infeed Air Conveyors System And 2-7 Divider. 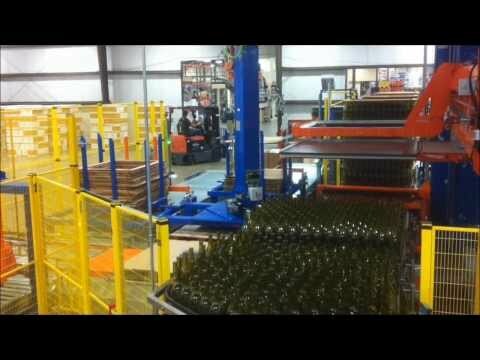 Air Veyor System and Palletizer Can Go From 16 - 64 Oz Containers At The Touch Of A Button. Both Air Veyor and Palletizer Are Self Adjustable From Job-to-Job. The Air Veyor Operating Speed Also Adjusts Automatically On Demand. 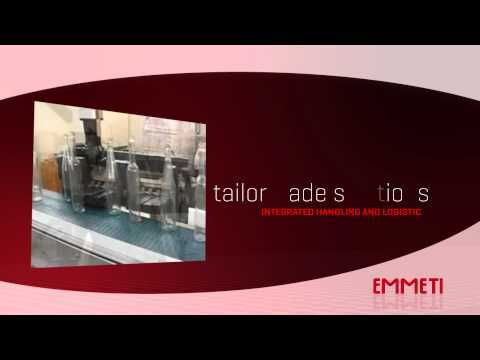 In This Video An Emmeti Pal MT630 Series Palletizer and A Logik Lobster Series Depalletizer For Palletizing & Depalletizing Using Pick&Place On & From Thermoformed Trays. Suited For Applications When Glass To Glass Contact Wants To Be Avoided As An Alternative To The Use Of Partitions Or Reshipper Cases. Or When The Shape And Geometry Of The Contaners Thus Requires. Or When Premium Quality Brands Or The Nature Of The Product And Their End User Acceptance Requires The Best Shelf Appeal No Matter The Cost Of The Added Protection. See Also Palletizing With Partitions. Note: Properly Applied Glass Surface Treatments Are Available And Should Also Be Considered As An Alternative To Avoid Buffing On Most Instances and For Most Practical Purposes. ick And Place Palletizing Using Tulips For Containers That Will Require Pickup and Discharge At A Different Distance Between Them For Thermoformed Operations or At The Same Distance For Reverse Tapered or For Palletizing With Partitions. Head Tool Is Automatically Changed To Sweep Head Shown In Storage Position Or Tulip Head For Extra Large Diameter Container. Other Head Options Available Are Tubes, Grippers, Bladders And Vacuum... Whichever The Challenge We Feel Confident We Will Have The Solution. 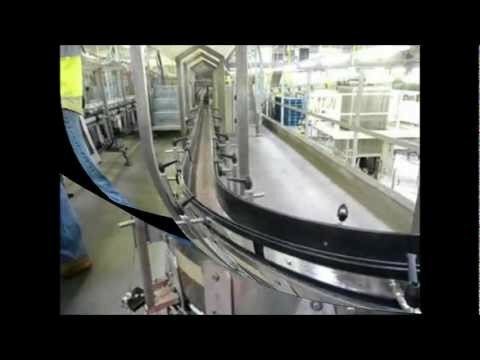 Automatic Guide Rails Adjustment For Zero Job Changes. For Flexibility and Productivity.